These heavy duty outdoor scooters are not designed for indoor use but the three wheeled versions can be used indoors in spaces where there is lots of room. Different manufacturers will have heavy duty models but their definition of "heavy duty" varies from company to company. For some companies heavy duty simply means a high weight capacity while others have heavy duty designs which resemble all terrain vehicles. You will find high weight capacities in several categories of scooters besides this category so I'm going to concentrate on the models which are really built for rough terrain. Heavy duty scooters are available in both three wheel and four wheel configurations however the four wheeled models are much better suited to outdoor use rather than indoor use because of their larger turning radius and overall larger size. You will find the weight capacities are high for these scooters but so are the speeds and power. As with other scooters, there are two 12 volt batteries in these scooters which are wired in series to give a total voltage of 24 volts to run the motor and any electric accessories installed. Scooters in this category will usually be equipped with the larger sized batteries offering more power to run these big machines and more mileage between charges. Scooter batteries are deep cycle batteries which are designed to provide a low amperage for a long period of time as opposed to a car battery which is designed to put out a lot of amperage for a short period of time. Every once in a while someone will try to save a few bucks by putting a car battery into a scooter. The car battery will be ruined in a few weeks, the warantee will be voided and they will still have to buy the proper batteries in the end. The scooter frames are made of round or square tubular steel which is reinforced and designed for rough use on many types of terrain where many scooters would wear out quickly. The weight capacity of heavy duty scooters is usually between 350lbs. and 500lbs. The tires on these scooters can be anywhere between 10" x 3" and 13" x 6" and are usually filled with air but foam inserts may be available for some of the smaller tires.. Air gives a bit better ride than foam filled tires and are less expensive to replace but they have to be inflated properly for the scooter to perform properly. Just like the tires on a car will lower gas mileage if under inflated, soft tires on a scooter will cause the batteries to need recharging sooner and range of travel will be limited. The size of the tires on this category of scooter make outdoor use on moderately rough terrain fairly comfortable and reliable. The seats on indoor scooters are usually fairly well padded and intended to be fairly comfortable for sitting over a longer period of time. They may have an adjustable angle back for added comfort and will likely have padding on the arms. To ease transferring on and off the scooter, the arms will flip back or up out of the way and the whole seat will swivel. The class of scooter may also offer a headrest and taller backrest on some models. The heavy duty scooter seats will often be available in different sizes to accomodate users of different sizes. The tiller of a scooter is where the controls are housed. There will be a lever of some sort which has to be pushed to release the brakes and send power to the electric motor that propels the scooter. When the lever is released the motor stops and the brakes automatically re-engage. The scooter key or switch which powers up the scooter is located on the tiller also. For comfort most tillers can be adjusted forward or back to best accommodate the reach of the user. 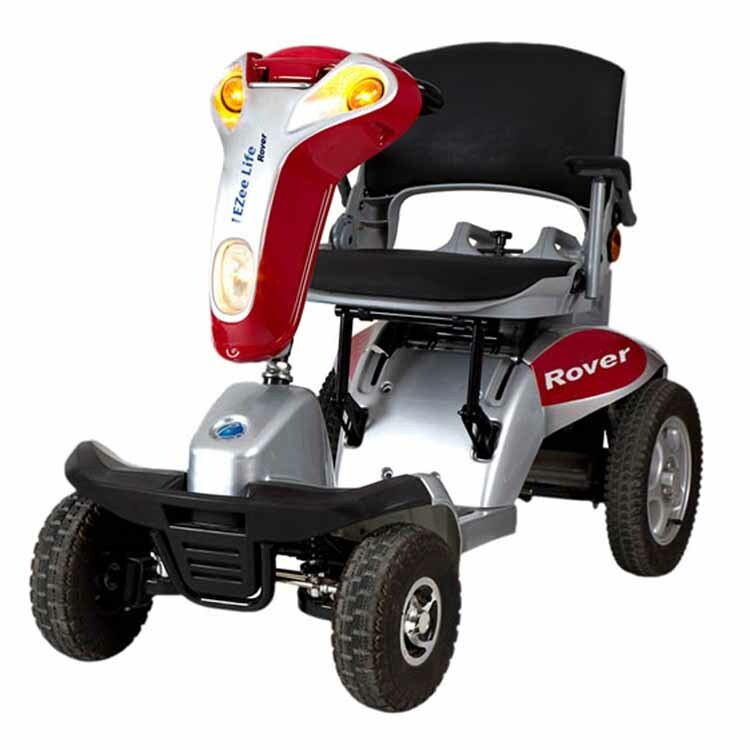 The heavy duty scooters also may have lights and/or mirrors installed on the tiller or available as optional equipment.